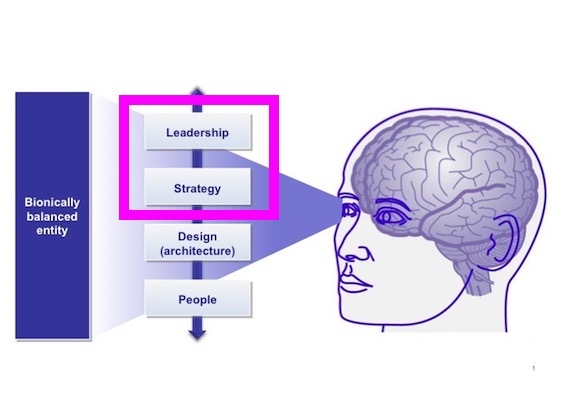 This blog concludes the Strategy Organisational Vital (OV) sub-series. We hope that many of you have and will continue to use the sub-series not as a ’strategy management’ but as a ’strategy management bursting’ guide. We need to look at strategy management through a different lens. Strategy ought to be less linear, after all, it’s no longer a black and white affair. It’s not something that can be applied to prop up business, without the other three OV’s [leadership, Design (architecture), and People]. Like water requires the combination of hydrogen and oxygen to sustain its state of water, bionically balanced entities require various combinations of the four OV’s to remain viable. It’s vital to understand, at every stage of this Effective organization series, the integrationist tendency of the bionically balanced entity. In this particular case, the interplay between the Leadership and Strategy OV’s and how it aids signature value addition. The premise behind the Effectiveness lab’s ‘bionic entity’ OD model is that sustainable signature value is attained when all the four OV’s work in sync, with varying oscillation and OD environments. For example, leadership alone, without strategy won’t get firms far. On an even more important note, even when both leadership and strategy are at work, but independently, signature value creation tends to remain elusive. The whole is greater than the sum of the parts. It’s implied above that none of the four OV’s on their own, can deliver bionic balance at the organization. Bionic balance only accrues when OV’s are intertwined. Leadership requires good strategy, good strategy requires good OD. design, and good OD. design requires people with the right skills and competencies. We have shared in the Effective organization series some examples of bionically imbalanced firms in East Africa and the Globe – Uber, Kenya Airways, Nakumatt, and Crane bank. We concluded from our analysis of the four companies that organizations that fail to adapt to an integrationist approach in the management of their ‘insides,’ are vulnerable to collapse. All the four entities above showed different levels of bionic imbalance. Also, the four organizations had one thing in common – that while certain OV’s were working okay, others did not. The result was a sub-optimal organization that didn’t sustainably create value. And finally, turn-around was likely when one or two of the OV’s, especially leadership was assured.